Carnations are pretty , longlasting and very popular as cut flowers. Why not make them at home and enjoy their beauty ? Duplex paper is hardier than crepe paper and gives a crisp effect. Take red Duplex paper and make 4 circles , (approximately 2 inches ) with a pencil. Use zig-zag sciccors to cut the circles to get the real look as carnations have jagged edges. Make holes in the centre of the 4 circles which will be used for making one flower. Take a 5 -6 inch long wire and make a hook on one end. Pass the wire through the centre of first circle and take the hooked end from the other hole. So there will be two holes in the first circle. Bunch up the circle upwards and tie it. Take the second circle and push it up the wire , put a dab of glue/ fevicol and stick it to the first petal circle. Bunch it upwards like the first one. Follow the same instructions for the rest of the circles. Keep the flower upside down to give the flower a natural look. Wrap floral wire round the wire. Use green duplex paper for caylx , draw thin star shape and stick it to the stem head with the flower. 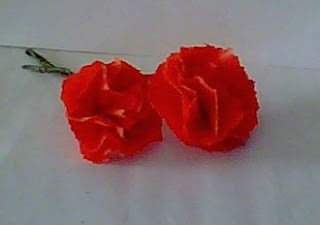 Make long thin leaves with green duplex paper and stick them to the stem. Several paper carnations in a bouquet or a vase look gorgeous !